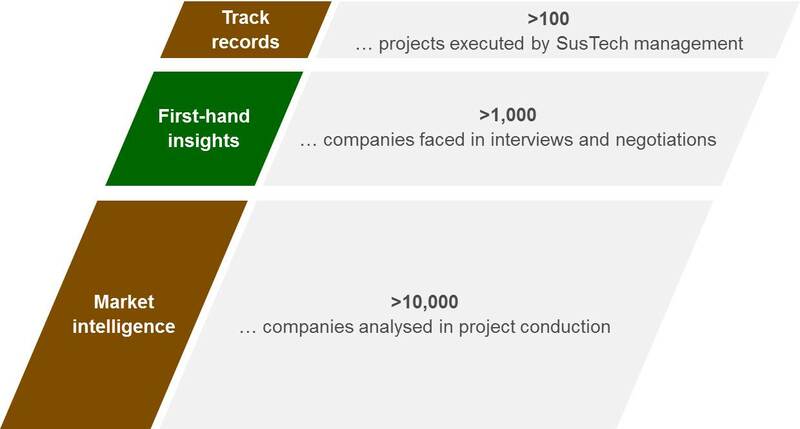 SusTech consult has been established to support companies that address some of the major technological and environmental challenges of tomorrow. Based on past experiences of our management and consultants we strive to outperforn our clients' expectations in today's projects. Our consultants have advised leading multinational corporations (e.g. Siemens, Bayer, Honeywell or Sinochem) as well as small- and medium-sized technology leaders in their specific market niches. While we support a "do good and talk about it" philosophy - especially regarding our clients' efforts to contribute to a better environment - confidentiality remains an elementary aspect of our work. Therefore please contact us directly for details about our experience and track records.